If you are doing any type of statistical analysis, you probably need to calculate mean, median and mode. There are lots of places on the Web you can find the calculations. This post is different than most in that it uses LINQ and Lambda expressions. Mean is the statistical average of a set of numbers. This one is easy with LINQ because of the Average function. This code uses the Average extension method on the IEnumerable class to calculate the mean, or average, of the numbers. Median is the middle number of a set of numbers. If there is an even number of entries, it is the average of the two middle numbers. This code first counts the numbers and divides the count by 2 to find the middle of the list. Note that the VB code uses the backslash (\) to perform an integer division where the C# code uses a forward slash (/) for the division. It then sorts the numbers in order using the OrderBy extension method and a Lambda expression that simply orders by the numbers. The last step is to get the element at the middle (if odd) or the average of the two middle elements (if even). The result is the median. Mode is the number that occurs the largest number of times. var mode = numbers.GroupBy(n=> n). Dim mode = numbers.GroupBy(Function(n) n). This code uses the GroupBy extension method on IEnumerable to group the numbers by number. It then orders them by the count and selects the first one. This provides the number that occurs the most times. Use these techniques whenever you need to calculate the mean, median, or mode. There are often cases where you need to group on multiple properties and potentially sum on others. This post details how to group and sum on multiple properties using lambda expressions. 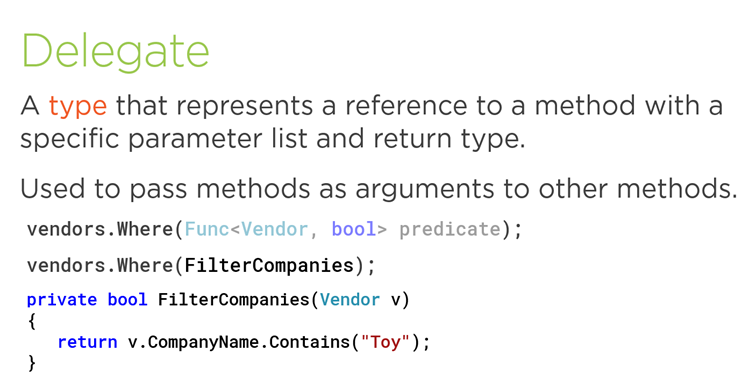 This example uses an Invoice class, since that provides many opportunities for summing. First, here is a basic Invoice class. Normally, you would populate the Invoice class from data in a database or other data store. But to keep this example simple, the values for the invoices are hard-coded. This code creates two invoices of type 1 that are dated 4/30/2010 and two invoices of type 2 that are dated 4/29/2010. Now for the fun part. This example groups on both the InvoiceDate and the InvoiceType properties. The totals accumulate the invoice amount and the number of items. This allows the code to provide totals based both on the date and type. This code starts with a GroupBy clause with a Lambda expression. The Lambda expression (indicated with the => syntax in C# and the Function keyword in VB) uses the new keyword to create a new anonymous type with two properties: InvoiceDate and InvoiceType. This technique allows the code to group on both properties. More properties can be included here if you need to group on more than two properties. Notice the Key modifier on the two properties in the Lambda expression for the VB example. This ensures that the anonymous type is immutable, providing read-only values. This is not necessary in the C# code because C# only supports immutable anonymous types. The next part of the above code is a Select clause with another Lambda expression. The Lambda expression uses the new keyword to create an anonymous type with four properties: the invoice date and type from the grouping and the two totals. Each total uses a Sum clause with a Lambda expression defining the property to sum. The group.Key syntax provides the key values from the grouping, which in this case are the properties from our first anonymous type. The group.Sum syntax provides a sum on a particular property in the original list. To view the results of the query, the code can display the items. Use this technique any time you need to group or sum information in your business objects. In this prior post, I demonstrated how to find a node in an XML string. In this post, I expand on that topic to find a set of nodes. You can then process those nodes as needed in your application. In this example, the set of nodes are displayed in a ComboBox. If you are targeting the .NET Framework version 3.5 or later, you can use Linq to XML to retrieve a set of nodes. This example using Linq. 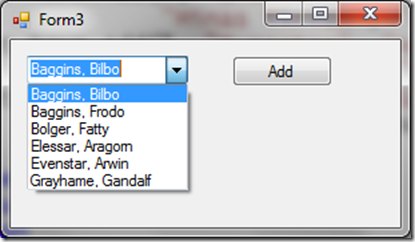 Starting with a simple example, let’s find the set of all regions and display them in a combo box. The code first finds the set of region elements. The C# code uses the XElement methods and the VB code uses XML literals. Only the name of the regions are needed, so the next statement selects the name attribute. Again, the C# code uses the XElement methods and the VB code uses XML literals. NOTE: You can also use the XElement methods in VB as well. The enumeration is then converted to a list so it can be sorted and assigned as a DataSource. The second set of code combines the set of Linq to XML statements into one for a more condensed version of the code. Use this technique any time you need to retrieve a set of nodes from an XML file. First, here is the basic code for binding a ComboBox to a DataTable. The Retrieve method on the Customers class retrieves a DataTable of customers. If you want to try this code, you can build a DataTable in code following the techniques covered here. You can then set the DataSource to the DataTable, set the DisplayMember to the name of the field to display in the ComboBox, and set the ValueMember to the name of the field to use as the field value. This is most often the unique key. 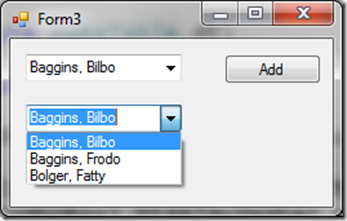 With Linq you can add filtering criteria. So let’s add a second ComboBox that lists only the customers with a last name that starts with "B". NOTE: Be sure to set a reference to System.Data.DataSetExtensions. 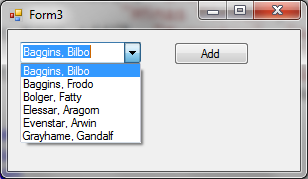 This code uses a Lambda expression to filter the DataTable to only those rows where the LastName starts with "B". The AsEnumerable extension method is necessary to allow Linq/Lambda expressions to work with a DataTable. Any field in the DataTable is accessed using c.Field<T> Or c.Field(Of T) where T is the type of the field. In this example, the field is a string. The second ComboBox is then bound to the query using the AsDataView extension method. 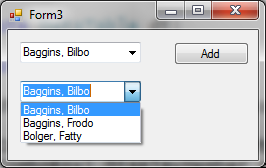 This allows the binding to bind the result as a DataView. But wait, there is more. Because of the way that binding works. 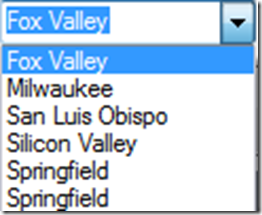 adding rows to the DataTable will add rows to the first ComboBox that is bound to the DataTable. AND if the new row starts with the letter "B", it will add it to the second ComboBox as well. No refreshing or re-executing binding code required. It just works!! Use this technique any time you want to bind a ComboBox to a filtered set of data from a DataTable. A common requirement with an XML file is to find a particular node. If you are targeting the .NET framework 3.5 or higher, you can find the node using Linq to XML or by using Lambda expressions. The C# code uses the XElement properties and methods. The VB code uses XML literals. NOTE: The XElement properties and methods work in VB as well. NOTE: This post was created based on a prior post that included both finding a node and adding new nodes. This post separates the first step to provide a more straightforward example. In this prior post, I detailed how to build lists of things using a generic List<T>. Once you have a list, you may need to find items in the list. There are several ways to accomplish this, but using lambda expressions is the most concise. 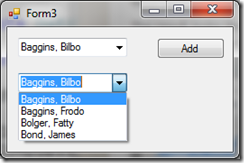 For example, here is how you find an item in a generic list using a for/each statement. Notice the amount of code required to loop through each item in the list and find the one with a particular customer Id. 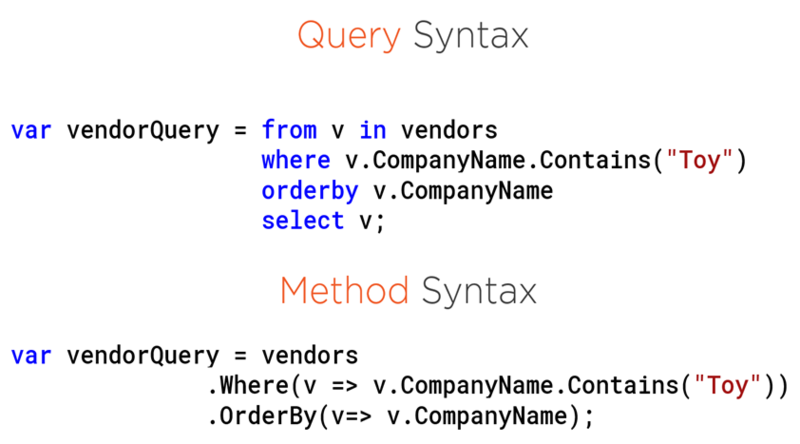 You may have heard about language integrated query (LINQ) and how you can use it to search a list. So LINQ is cool, but the code does not seem much shorter. Now let’s look at using lambda expressions to find the item in the list. The code begins with the set of parameters to the lambda expression. The => is the “goes to” or lambda operator. The remainder of the code is the expression itself. In this case, checking for the item in the list where CustomerId is 4. The code begins with the word “Function” along with the set of parameters to the lambda expression. The remainder of the code is the expression itself. In this case, checking the item in the list where CustomerId is 4. .NET 3.5 added a large list of extension methods on the Enumerable class. Any object that implements IEnumerable or IEnumerable<T> (basically any object you can do a for/each over) can use these methods. Many of these extension methods (such as the FirstOrDefault method shown in the above example) support lambda expressions. The FirstOrDefault extension method of the Enumerable class returns the first item in the list or the default value for the object. If you pass it a lambda expression, it returns the first item in the list that matches the Boolean expression. The Enumerable class is new in .NET 3.5 and is part of the System.Linq namespace. 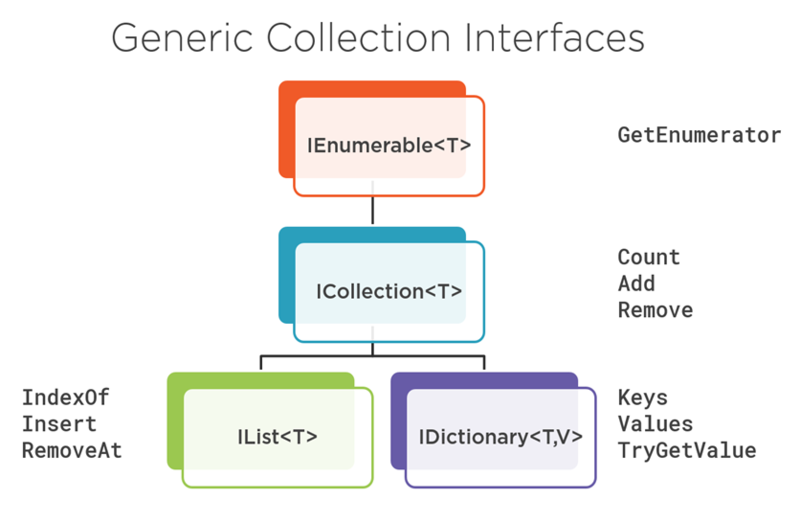 It provides a set of static methods that allow you to query any object that implements IEnumerable, basically meaning any object that supports a for/each. This post focuses on the Repeat method of the Enumerable class and some of the helpful things that this class can do for you. NOTE: Be sure to set a reference to System.Core. First, at the top of your code file, add this code. You can then use the Enumerable.Repeat as shown in the following examples. The first example initializes an array of 10 integers to –1. The second example initializes an array of 10 strings to "A". The third example takes a single value and creates an array from it. This is often necessary when a method requires an array instead of a single element. The random number example provides another way to generate a random numbers. In this case, it generates 10 random numbers between 0 and 9. Note that this does not ensure uniqueness, so the number 2 for example could occur multiple times in the list. The last example initializes a list of business objects to an empty set of objects. You could use object initializer syntax in this example to initialize all of the objects to some set of values, such as setting the State = "CA". This could be useful in setting up data for testing or prototyping. Use the Repeat method any time you want to repeat values in an array or list.